Not much going on these days. I know that sounds ridiculousness since we have a whole new human being hanging out with us all the time but seriously we're not doing much. Unfortunately, I've been in a ton of pain for the past few weeks (4 weeks tomorrow actually) & that's not cool. I knew that my last c-section was a fluke because it was so easy & not much pain & I was ready to go pretty quickly but I did not expect the gosh-awful pain of this one. It has been a constant cycle of feeling like I've been cut in half, then achy like I'm coming down with the flu (I'm not) & the joyful stinging rage of my incision. And yes, I went to the doctor & all is well, completely normal, blah blah blah. Rather than use the same incision as last time, they had to make a new one due to the old scar tissue being in the way & so I've got the old scar tissue irritated or something (I really shouldn't be allowed to relay medical information because I retain so little of the facts) plus the new incisions healing. Then there are some other issues that are even less savory to discuss because they involve side effects of the pain medication with codeine that add even more trauma to the system. But I'm not dying & my cut is actually pretty well healed so I can stop worrying that my innards are going to spill out at any moment. And blessed be to Heaven, I can take baths again!! No bubbles but I'm not six so I'll survive. 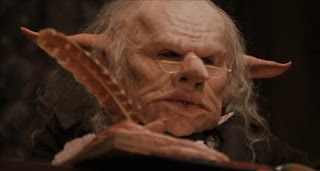 Oh, I finally got up the nerve to take a good long look at my incision. Well, now it's kinda two - the old faded scar & the new fresh red one. The new one is longer & goes down a bit at the ends so with it being right above the original one, it has a nice grotesque frowny face look to it. If I got a scrawled tattoo that says "Why so serious?" I could have the ultimate tribute to Health Ledger's Joker! I assume this scar will fade as much as the first one & I'll just another badass reminder of my lovely boy's entrance into the world. After that boring & somewhat gross stuff, I'll share some pleasantness. Evan is quite the eater like his big brother Benny so I think we're on the way to having another Mr. Buttersticks in a couple of months. It's not nice to compare my son to a Gringotts goblin, is it? Mother of the Year, huzzah! Anyway, in other exciting news he slept really well last night. I am terrible at keeping track of how much he sleeps usually because he spends about half the time in his little bassinet & half the time sleeping on me in bed. I can't sleep on my side yet due to the evil searing pain so & instead sleep on a large pile of pillows so I don't have to do much work to sit up but that has nothing to do with anything. ANYWAY, last night we put him down when we went to bed at 10.45pm & he didn't wake us up until 3.30am. Then he just fed for about 20 minutes & slept until a bit past 6am, which is much more like what I assume is his normal timeframe. I once tried to keep track of his times, etc. at night so I was going to send myself a quick email every time he woke up because I'm always on my ipod touch anyway playing games or reading news at bizarre hours when I'm feeding him but the emails I sent myself were bizarre & made no sense. I literally just needed to put how long I fed him because the email would already have the time on it. I gave up when one email was just one word that didn't actually exist in the English language - I wish I had kept it or wrote it down because when I read it in the morning I died laughing. What little brain survived the first child is broken now. I'm excited to say that Australia is catching on to the Halloween festivities a bit. I have yet to see any editorials about how Australia doesn't need to give in to an American money-grubbing holiday so that's nice & I see Halloween candy, costumes & decorations popping up at stores all over! 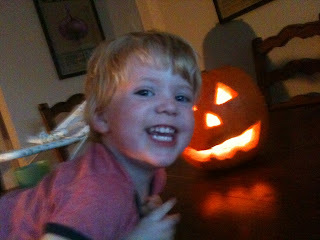 We were even able to grab a pumpkin for carving at our lovely grocery store. Ooooh, remember when I told you that our grocery store was getting clothes?? I finally got to check it out last week & I have to say I was impressed. Mind you I am cheap & not stylish but I found some of the clothes downright cute. If I get anything notable, I will share it with you! But back to the pumpkins, we carved away last night & now have a gorgeous little jack o'lantern brightening our day! 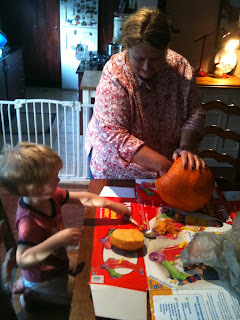 Grammy (pronounced "Ra-ra" by Ben) & Benny scooping out pumpkin innards. Dada & Ben carving our pumpkin. We are all for pantsless toddlers on hot hot hot days. Ben & the final product. Someone is loving Halloween already! I have my doubts that we'll actually get any trick or treaters, though our neighborhood is such a family friendly little labyrinth that it would be perfect. I'll get some candy just in case. The city of Gosford is actually having a daytime Halloween party & trick or treating through the shops for kids so that's a step in the right direction & I think Toys R Us is having a party too. I realize that they are all just trying to convince us to shop more but I'm just excited that someone is jumping on board the holiday! Um, what else? Oh! We finally found a double stroller that we loved & was exactly what we wanted - the style, the structure, the stylish stripes & sophisticated black background. And $200 off! Too bad it won't actually fit into my clown car. Not the trunk, not the floor of the backseat, not in the front passenger seat since I rarely have guests travelling with me anyway. So Marcel tried every double stroller in the store & literally one fit & it was nearly $1,000 so we'll probably skip that one. Something tells me we're going to have to settle for one of those umbrella double strollers - we've had so many good experiences with our $30 stroller that I'm prejudiced against umbrella ones but that makes me an idiot. So, what to do? We have the awesome baby carrier I won from babyology.com.au & logic tells me I should just figure out how to use that once I'm in a better physical condition, I should just carry Evan in that & stuff Ben in our current awesome pram. Ugh, I don't want to do this. What would you do? Please remember that Ben likes to run for the hills & is very tricky so until he comes down a few more notches (he is getting better slowly but surely), letting him just walk isn't quite an option. Those little scooters that attach to the back of the pram is not an option either because he'll lose interest & take off for the hills as well. Ah well, it's taken me an entire day to write this pathetic little blog so I'm going to go now. 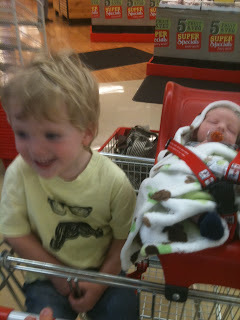 I'll leave you with a couple more pictures of my adorable little family - grocery shopping & lounging. Evan is sometimes willing to take a pacifier. I haven't decided how I feel about this development but it's saved us from a few meltdowns.